I am a control freak. Every day is a battle between my dictatorial urge to exert complete control over every aspect of my life and my battered, overly stressed psyche. I moderate whatever I can: how much work I do in a certain day, what kinds of food I eat, the amount of food I end up eating, how much money I spend on food, how much time I spend in my room, and when I want to get things done. 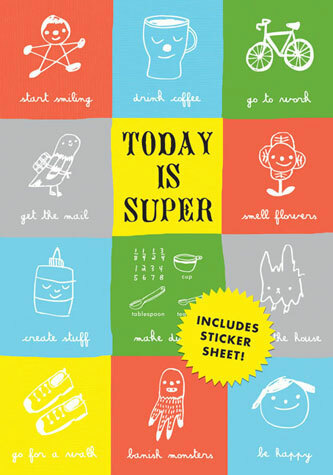 You should see my day planner – it may be adorable and uplifting on the outside and come with stickers (I know, it looks so harmless here), but on the inside, it’s a sentence for anxiety attacks. I’ve scribbled pages and pages of to-do lists that range from my academic tasks for the week to what I need to buy at the grocery store to certain ways I want to think. They’ve taken multiple forms, too – I’ll draw a calendar next to an obsessive bulleted list to remind myself that my tasks aren’t simply jarred strings of words, but real actions that are chained to deadlines and time. That’s right, I have multiple lists for the same thing. My attempt to become more organized and subsequently think more clearly has only thrown me into an even larger spiral of worrying. My motion to reduce my anxiety has not only backfired, it’s managed to stress me out even more. Did I mention that I have Generalized Anxiety Disorder? Yeah, that plays a huge part in this. I’m a worrywart. You probably inferred that from the tone I used earlier in this post. I will worry about anything – I worry about everything, actually: grades, whether I’m marketing myself enough, what I eat, my cholesterol intake, time, my friends, my family, my weight, not getting enough sleep, sleeping too much, my performance, my car’s MPG, you name it. It can take me a matter of seconds to trap myself in a cycle of anxiety, and once I’m in there, it’s very hard to pull myself out. I have to take pills for it – pills that are supposed to mellow me out, which just make me tired all the time, and bipolar pills, because I can’t stabilize myself when I get anxious. For some reason, I love worrying about things I have absolutely no control over. This category namely includes quarrels within my family (and since it’s divorced and partially Iranian, that happens very often), what other people think of me, and any negative situation my friends get into. Of course, it’s only logical that I cope with situations I can’t control by taking it out on myself. Here’s where my nature as a control freak comes in. I tell myself that by achieving perfection, I can fix things that I honestly can’t do a thing about. I’ve tried to cope with my school-based stress and ignore the series of intense fights my dad and sister had a few years ago by cutting off a chunk of my food supply. That worked stupendously. Then I’ll bottle everything up and crack weeks or months later. That method helps me out too. Ignoring my anxiety or covering it up with a control-based issue is my go-to method is coping with a stressful or depressing situation. The thing about my coping mechanisms is that they don’t work. They make things much worse, actually. There’s also the matter that they’re completely inappropriate methods of stress management. Since when has shutting myself away from the world and hiding in my bed helped me get over something? It hasn’t. It hasn’t helped me at all, but for some reason, I am set on doing it every time something troublesome comes my way. I cannot do this anymore. I can’t! It’s driving me crazier. Even thinking about my anxiety is stressing me out. I have to change. And it’s not just so I can make it past May 7th in one piece – I don’t want this interfering with the rest of my life. I want to be a journalist. I want to travel and write and get paid for it somehow. How am I supposed to get my stories and interview people if I’m afraid of talking on the phone? I’m afraid that if I can’t tame my anxiety, I’ll be living with my parents or something and not be able to work efficiently. That isn’t exactly my dream. I have to tackle this on a short-term scale right now because my finals are creeping up on me and I’ve got two projects due within the next week. They’re both for my journalism classes, so that means I’m going to have to talk to people I don’t know and sit at a computer for a long time. I can’t have any distractions, especially not anxiety. Then there’s studying for finals, which I’m actually not too concerned about. But I’ve got all my notes typed up, so I don’t even have to let any senses of impending doom concerning not having studied for my news writing final at all bother me. That’s good. I’ll get my projects done. I’m typing that again to encourage myself. It’s working, just so you know. I have to say that the easiest adjustment I’ve made was shutting off all my worries about food. I mean, yeah, food is important. But for these next few weeks, I’m going to try not to worry about what I eat as much. I mean, I’m not scarfing cheeseburgers down for every single meal. And at this point, I really believe that a slice of bacon is healthier than all the stress I’ve endured over the years from fixating on food so much. So for now, all worries concerning food will be shut off, and I’ve made a good start. I drank one of the best iced lattes I’ve ever had today, and I spontaneously took 15 minutes aside yesterday to sit down and have a few scoops of blood orange gelato.